A new report from www.GetHearth.com shows Millennials may avoid traditional financing methods that are vastly more affordable. Home renovation projects can be an exciting chance to freshen up the look of your abode. But the novelty can wear off quickly if things get complicated or you start to go over budget. That’s especially true if you’re using credit cards to fund the renovation… which is exactly the path taken by 16% of the Millennials polled by www.GetHearth.com in their latest Home Renovation Survey. However, 50% of Millennial homeowners are “hesitant” or “anxious” about using a traditional home improvement loan through a bank. But according to HomeAdvisor, even the low-ball cost of renovation is significantly more than $2,000. The costs above are for multiple rooms, so let’s look at the cost of something smaller. Out of Hearth.com’s survey respondents, 17% wanted a bathroom upgrade. Again, according to HomeAdvisor the lowest cost you could expect would be $2,500 and most remodels total up to more than $5,500. So, let’s say you want to finance $5,000 for a modest remodel. Credit card or loan? If you set your loan term to 36 months, the monthly payments would be around $157. Total interest charges would be $640.55. For the credit card? Even if you kept the same fixed monthly payments of $157, it would take 42 months to pay off the debt instead of 36. And total interest charges would add up to $1,551.95. On minimum payments, the cost would be more than the original amount borrowed – you’d pay $8,994.14 over the course of 367 months. Look, as a Gen Xer who just bought my first home in August 2008 right before the crash, I get the reticence about traditional financial products. My husband and I worked like hell to qualify for a traditional fixed-rate loan. Then we promptly watched our property value fall to less than 2/3 of the mortgage we’d just started paying. We were pissed – I had no end to my personal anger at the financial sector. And we ended up taking a loss on the short sale six years later. But the answer to a bad experience with traditional finance is not to find riskier, more expensive forms of financing. In fact, traditional financing options tend to have the lowest costs and least amount of risk. For instance, our situation was bad with a fixed-rate loan, but it would have been even worse with an Adjustable Rate Mortgage. If you don’t trust big banks, find smaller banks – go local or independent. Or better yet (in my opinion) find a way to become a member of a credit union. They exist to support the financial needs of their members. You tend to get better service and better rates on loans. Then you can use traditional lending options and avoid risky products that just lead to more trouble. What’s the right way to finance home renovation? If you want to minimize risk, the personal loan is your best bet. As long as you can keep up with the monthly payments, you should be golden. Since you make payments in equal installments, it’s easy on your budget and you know exactly what to expect. 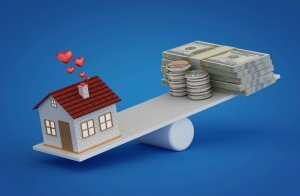 The other two options involve tapping into your home equity. That’s the value of your home as an asset. You calculate equity by taking the fair market value of the property minus the remaining balance on your mortgage. Most lenders will let you borrow up to 80% of your equity. So, if you have $100,000 of equity, you can borrow up to $80,000. With the home equity loan, you take out a specific amount that you then pay back with installment payments. With the HELOC, they tell you what your available credit line is and you take money out as you need it. For most HELOCs you pay interest only for 10 years, then you have to start paying back the money you took out. And by alternatives, I mean alternative financial services (AFS). Things like payday loans and no-credit-check installment loans. For my part, I’m still personally wary of touching equity. We managed to get a new home in 2014 and the equity is now over $100,000. While that gives us plenty of breathing room to borrow against, our previous upside down mortgage still gives me nightmares. Still, I could borrow for a nice $20,000 renovation and mostly not risk negative equity even if the real estate market collapsed again. I’m sure I’ll eventually get comfortable with the idea, but I’ll always be conscious of not overborrowing. What I won’t do is take out $20,000 in credit card debt. As a writer who works with a bunch of credit counselors, I know the nightmare financial stories of what that does, too. And in many ways, they’re as bad as the nightmare of negative equity. So, Millennials, even if you watched your parent lose everything in the crash and blame big banks, don’t lose confidence. There are financial institutions out there that don’t want to screw you over. You just have to be willing to look for them.